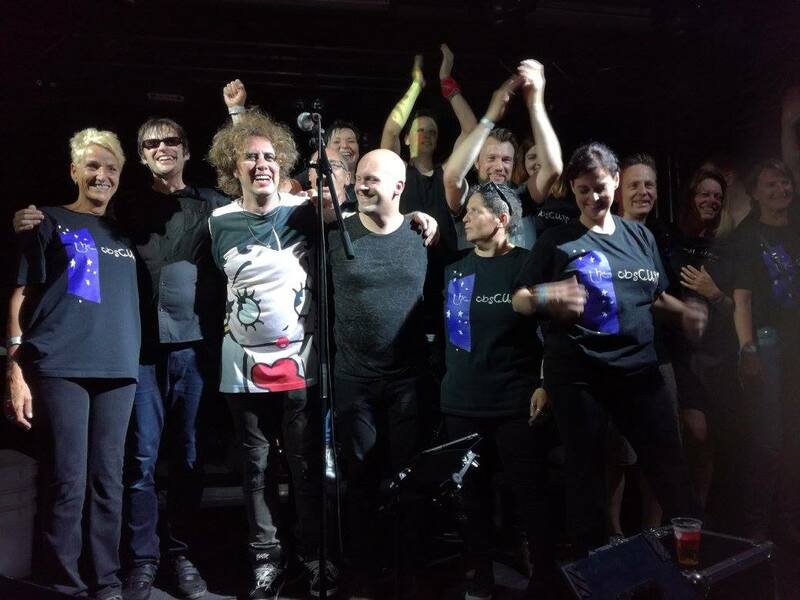 what an ending of the year with a lot of Curenews in December: a 40 year Anniversaryconcert in London, Tim Pope busy with a movie about the Cure with unseen footage, and who knows what will be announced more to celebrate our favourite band next year. December is also a nice period to look back on the past year for the obsCURE and we must say it has been great. We like to thank all fans and followers. Without you we would not be able to do this. We made a video to look back upon every show we did this year and we want to thank all photographers for taking and providing the nice photos during our shows. 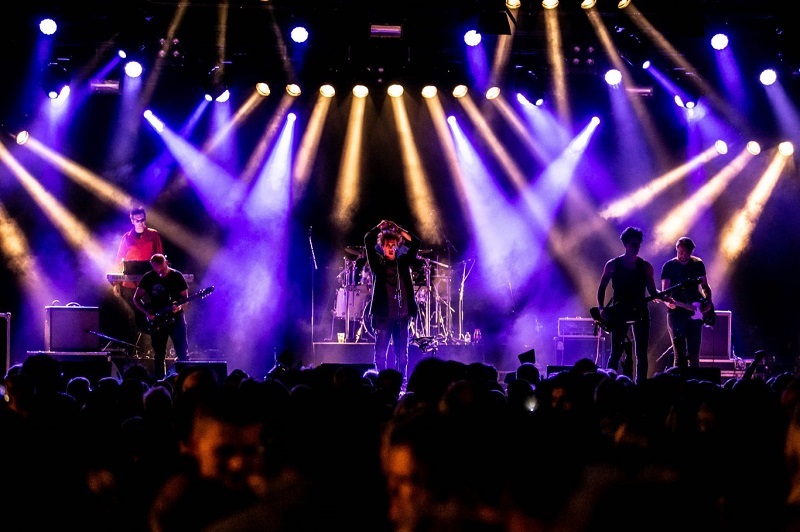 For next year we already have 6 shows programmed (BE, NL, DE) so hopefully we meet again. we’ve not been so busy with news on this website but on facebook you can find more updates regularily. Just to let you know that the first half of the year is done and we have been playing in four countries this year so far: Germany, Netherlands, Belgium and Luxemburg. All events were a blast and the results can be seen on our updated photopages where you can find pics of each gig. The obsCURE wishes you all a happy holiday season. Our band would not be where we are now without your loyal support. We had a great 2016 and many thanks to all people that had a little hand in this (organisations that booked us, soundcrews, lighting crews, YOU,…). 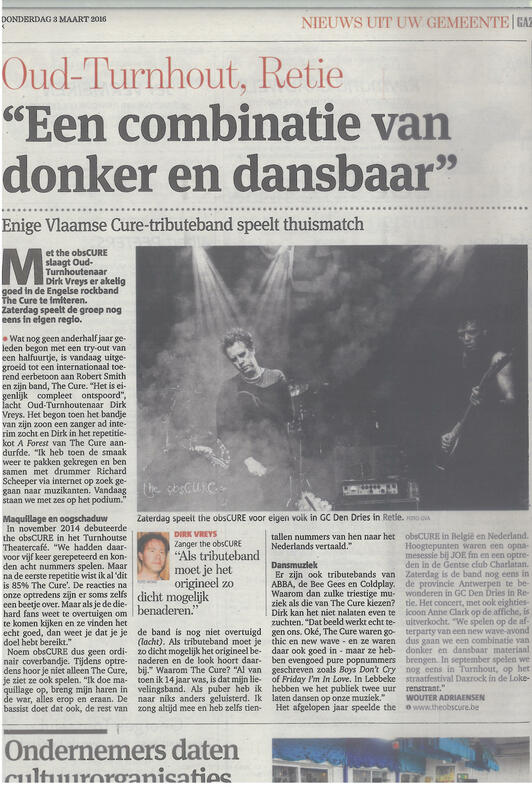 We were able to play in Germany for the first time, in french Belgium (Rixensart 5000 people), got into the national papers after our gig in Retie and many more other fun experiences. Looking ahead to 2017 we have a lot more upcoming in the first months and are able to play in Belgium, Netherlands, Germany and we add Luxembourg to this list. this video is for YOU, our fans, to say thanks. Mooi in de kijker gezet op het webzine Snoozecontrol. Zij zetten normaal geen cover- of tributebands in de kijkers, dus wel vereerd met de aandacht. Headlining in front of 800 people: what a feeling! 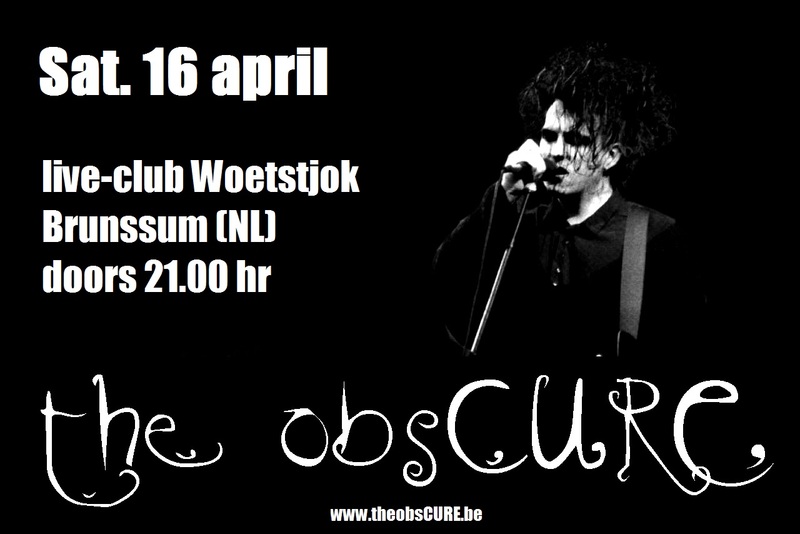 Tribute band the obsCURE succeeds to imitate the Cure so well that it sometimes gets creepy. This Saturday they play in their homeregion. 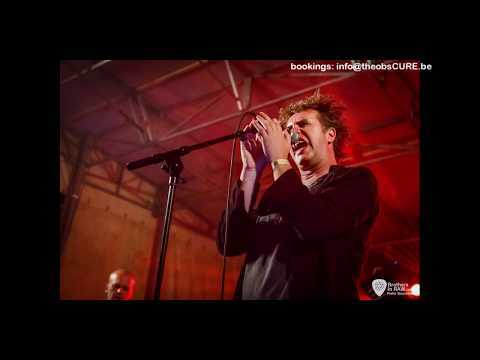 Not even one and a half year ago it started with a try-out of half an hour and today it already has grown into an international tribute to legend Robert Smith and his band the Cure. Hierbij kondigen we graag ons optreden aan op 16 april in de leuke liveclub Woetstjok (Brunssum) in nederlands limburg. 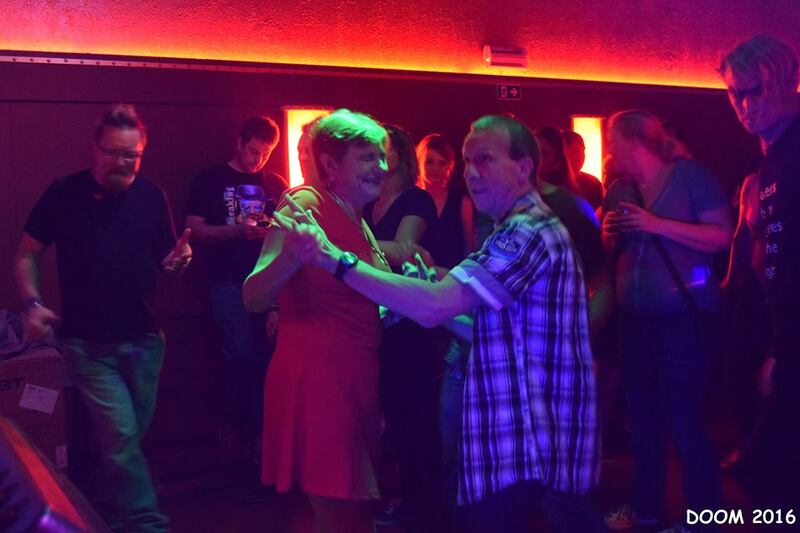 Het is ondertussen al de derde keer in een dik jaar tijd dat we daar gevraagd worden en we nemen aan dat dat niet zomaar is. 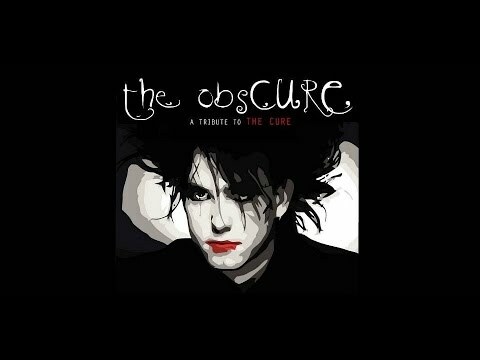 De voorbije twee keer werd het een leuk dansfeestje op de hits van the cure en we gaan ervoor zorgen dat het 16 april niet anders wordt. 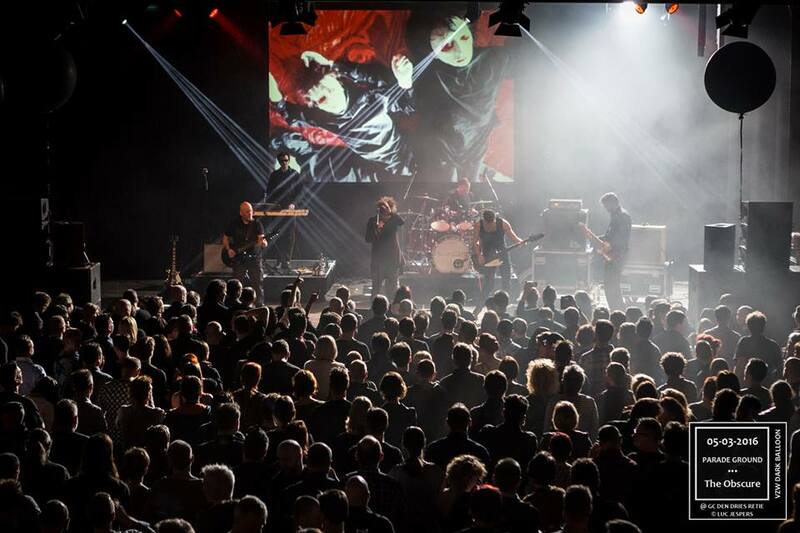 We are pleased to announce we will play for the third time already at liveclub Woetstjok in the Netherlands. Last two times we and the audience had a blast with people dancing from begin to end and we hope to repeat this again. We finished our official promovideo . Please share with your friends if you like . We had a great first year as a band. Big thanks to all organisations that had us on their stage and a very big thank to all the wonderful people we met this year that came to see us. We received a lot of positive comments and vibes from you and that encourages us to start the New Year with lots of energy. Hope to see you again in 2016 somewhere, sometime, somehow….